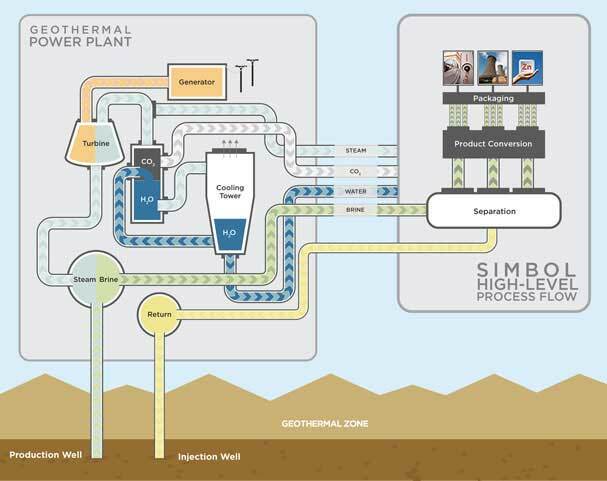 Are geothermal power plants the sustainable mines of the future? The U.S. DOE funds projects aimed at developing ways to extract valuable minerals from geothermal brines. Where's Canada? Image courtesy of Simbol, Inc.
A wasted opportunity? That’s what the DOE thinks. Last summer, the department committed more than $4 million to nine geothermal projects aimed at recovering both heat and minerals from brines. Work on those projects started in October, with results expected by fall 2016 or earlier. In February, it was reported that Simbol – which was one of the company’s that received DOE research funding last fall – had dismissed most of the employees working at its demonstration plant. It was a sign, some observers said, that the company is having a difficult time raising capital for its commercial plant, which at full production capacity is designed to produce enough lithium for more than a million electric cars.